Here’s an example of how not knowing how to read (and not knowing how to quote) results in intellectual confusion. The example comes from a noteworthy Confederate heritage FB site. I get where you’re coming from, Mr. Riley. I shook my head after reading this, too. Why? Could it be that this is what Earl Hess wrote? Pages 97-97 of Hess, The Union Soldier in Battle (1997) reprinted in From The Civil War Soldier: A Historical Reader, edited by Michael Baron and Larry Logue (2002). 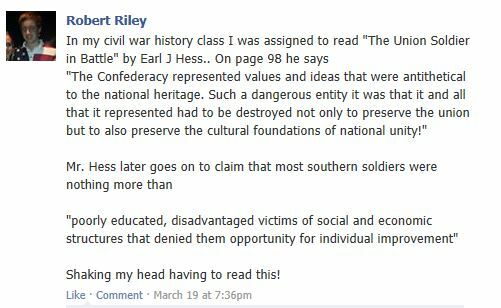 Why, yes, Mr. Riley, this is what Earl Hess wrote. You appear to have left out several key words. Why is that? Page 102 of Hess, The Union Soldier in Battle.Why, Mr. Riley, it seems you left out some words again. Why is that? Why, Mr. Riley, it seems you left out some words again. Maybe it’s just me, but I think if someone feels they have to lie in order to support their cause, they’re confessing that it can’t stand on its own merits. Please tell me this is just a really, really, really bad joke. Everything you Union sympathizers do and say is predicated upon a never-ending pack of lies. Go ahead,tell everyone where the Constitution prevents the people of a state from declaring its independence. Boom, the lies start. Now tell everyone which federal laws were in place in 1860 which made secession illegal. Boom, more lies. Now tell everyone why the principles of the Declaration of Independence didn’t apply to confederates. Boom, more lies. Now tell everyone that the colonies didn’t separate (secede) from the British Empire in 1776. Boom, more lies. Now tell everyone that the citizens of the Northern states didn’t own and traffick slaves. Boom more lies. Now tell everyone that the North went to war to free slaves. Boom, more lies.Now tell everyone that Lincoln and King George weren’t fighting for exactly the same thing. Boom, more lies. Now tell everyone that the North didn’t profit from slavery, and that the Boston textile manufacturers weren’t gobbling up slave cotton year after year. Boom, more lies. Now tell everyone that slavery wasn’t legal in the United states during the war. Boom, more lies. Now tell everyone that George Washington, Thomas Jefferson, James Madison and Patrick Henry weren’t slave-owners. Boom, more lies. Like I said, you people are foul and vulgar liars whose cause is nothing more that a thick pack of grotesque lies. You may fool each other, but each one of you knows that you are all just a bunch of lying liars. Oh look, another person with a complete lack of understanding the Constitution because it wasn’t written in a way he can understand it. Or is the same person with a different name? Study some history and you might understand what actually happened instead of what you want to have happened. My American History to 1865 students know far more history than you do because they participate in what is called the learning process. As for lying, well, you just did a lot of it right there. Better get back to the Confederate Catechism class where you can feel better about worshipping your ancestors who fought for slavery and said they were. I was going to reply to this rant, but then I realized….what’s the point? You are obviously set in believing this idiotic notion of the Lost Cause that you hold so dear. Guess what. The South lost. Slavery ended. That’s a good thing. Deal with it. Rant on somewhere else. It’s the same as the others. This guy rejects facts and supplies none of his own. We provide tons of information and they provide none. And they wonder why we laugh at them. Saying something is true is not enough. You have to back it up with facts. The Lost Cause has no facts. That’s why people are ignoring it. I don’t recognize the “us” vs “them” mentality. That would imply that they are worth recognizing as a legitimate entity worth competing with. If Rathbone keeps going “boom” like that, he should probably consult a lower gastroenterology specialist.